Gates graduated from Lakeside School in 1973. He scored 1590 out of 1600 on the SAT and subsequently enrolled at Harvard College in the fall of 1973. Prior to the mid-1990s, an SAT score of 1590 corresponded roughly to an IQ of 170, a figure that has been cited frequently by the press. 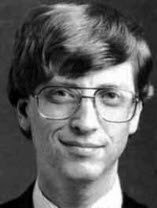 While at Harvard, he met his future business partner, Steve Ballmer, whom he later appointed as CEO of Microsoft. He also met computer scientist Christos Papadimitriou at Harvard, with whom he collaborated on a paper about pancake sorting. He did not have a definite study plan while a student at Harvard and spent a lot of time using the school's computers. He remained in contact with Paul Allen, joining him at Honeywell during the summer of 1974. The following year saw the release of the MITS Altair 8800 based on the Intel 8080 CPU, and Gates and Allen saw this as the opportunity to start their own computer software company. He had talked this decision over with his parents, who were supportive of him after seeing how much Gates wanted to start a company. 1973: Gates enters Harvard as a pre-law major, but soon shifts focus. He quickly runs through the university’s most rigorous mathematics and graduate level computer science courses.